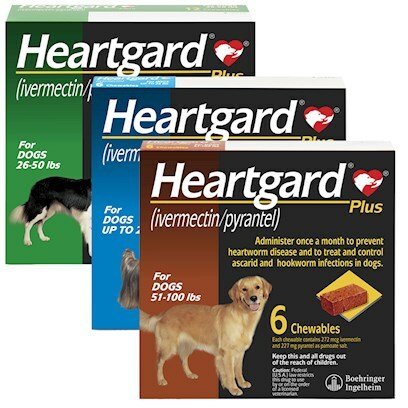 The Heartgard brand is among the most trusted heartworm prevention medications, and for good reason. Heartgard Plus Chewables for Dogs helps protect your dog's health by preventing canine heartworm disease, as well as kill hookworms, and roundworms. Rated 5 out of 5 by 705 reviewers. Good product and arrived in very good condition. Love this product. Saved lots of money. I have always used this product. The product is simple and effective. My dogs eat this as if it was a treat. PetCareRx are quick to ship, which it what I needed. This product is absolutely wonderful for my dog! Heartguard is essential to my dog's health. My dog likes this product! Good stuff and dog likes it! It is well worth the expense to avoid heart worms! Recommended by my vet and my dog! Our Vet recommended, so do we. Easy to order, good value and receives very quickly. My boxer gets excited to get this "treat" every month! I've used this product for over 10 years. Max thinks Heartgard is candy. Keeps my dog from heart disease. This is one item he likes to take.